In what is being interpreted as an effort to prevent well-known social activist Teesta Setalvad from going abroad to deliver lectures on human rights issues, she and her husband, Javed Anand, have been booked for what the Ahmedabad crime branch has called “fraudulently” securing Central government funds worth Rs 1.4 crore for her NGO Sabrang Trust between 2010 and 2013. One of India’s topnotch human rights defenders who has fought and won several 2002 Gujarat communal riots cases, just as in previous cases against them, in the latest attempt, too, the original complainant is a former employee of another NGO she heads, Citizens for Justice and Peace (CJP), Rais Khan Pathan. 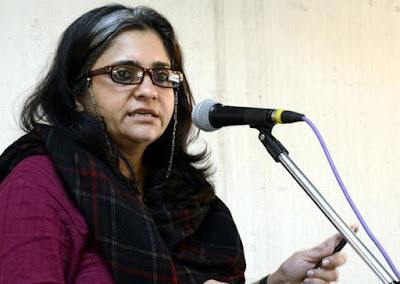 Calling the attempt to book her as “nothing short of a coercive method to prevent Setalvad from going on a long planned trip for human rights lectures abroad”, an official statement by CJP says, she has been invited to Canada by Sikhs of Indian origin to commemorate the 100 years of the Jallianwala Bagh massacre. After visiting Canada, Setalvad is scheduled to deliver lectures at Harvard and several other cities of the United States. Giving details of the project, Khoj (innovation), for which she had sought government funds, CJP says, it dates back to 1994, when Setalvad and Anand started a programme for school children which was christened as ‘Khoj: Education for a Plural India’. A project of Sabrang, Khoj evolved educational modules which were implemented in both privately run and civic corporation-run schools in Mumbai and elsewhere in Maharashtra over the years. The project involved the crucial area of education policy, especially democratization of the social studies and history syllabus and text-books. Part of the team constituted by Parliament in 2004, Central Advisory Board of Education (CABE), during her decade-long association with CABE – which involved preparing textbooks in government schools not using the Central Board of Secondary Education (CBSE) syllabus, including those run by religious and social organizations – Setalvad came to know of a grant by the Ministry of Human Resource Development under the Sarva Shiksha Abhiyaan. “On behalf of Sabrang, Setalvad submitted the proposal for grant from the Ministry of Human Resource Development to then Joint Secretary of the Ministry of Human Resource Development on March 8, 2010”, the statement says, adding, after approval of the proposal, the NGO was disbursed Rs 58,72,500, Rs 26,66,570 and Rs 54,20,848 in fiscal years 2011-12, 2012-13 and 2013-14 respectively. “The project benefited 192 schools through direct teaching and teacher training programmes. Ten libraries were set up across Maharashtra and most of the books for the libraries were procured from Government publishing houses”, the statement adds. Meanwhile, in a setback to Gujarat police, the Bombay High Court has ordered that Setalvad and Anand should not be arrested till May 2 in case in the criminal case lodged against them by it. A bench of Justice Revati Mohite-Dere gave the two interim protection from arrest on their plea for “transit anticipatory bail”, filed on Wednesday. While allowing their plea, the bench asked them to appear before the probe agency on Friday for recording their statements and later, as and when required. It is so obviously a case of a disgruntled "employee" taking it out on her knowing full well that the state government will take his word against hers. I have worked with her briefly and know what a wonderful person she is.